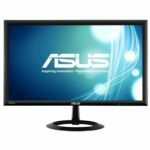 The ASUS VE248Q monitor is an affordable, modern looking monitor which offers Full HD resolution, a rapid 2ms response time, and various exclusive features including built-in speakers and optimized picture presets. It’s built eco-friendly as its panel is mercury-free, it’s packaged with recycled material, and it significantly saves on power consumption. 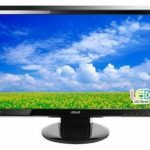 Overall, it is a great budget monitor for casual gaming and everyday use such as web surfing, movie watching, and other multimedia use. 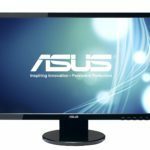 The ASUS VE248Q PC monitor features a TN panel which means that even though it may not have highly accurate and consistent colors as IPS panel monitors, it is much more affordable and doesn’t suffer from the IPS glow or backlight bleeding. Moreover, it allows for a rapid 2ms response time which will entirely eliminate ghosting and trailing of the fast moving objects in both everyday use and fast-paced video games. The 2ms response time can even be increased with the Trace Free feature in the OSD menu. However, TN panel monitors also feature inferior viewing angles which amount to 170 degrees horizontal and 160 degrees vertical. But, given that you can tilt the screen of the monitor by -5, 20 degrees, you will be able to enjoy an immersive viewing experience even when watching the monitor from a distance or a different angle after you adjust the appropriate angle. The ASUS VE248Q boasts 50,000,000:1 dynamic contrast ratio. This makes for the notable distinction between the darkest and the brightest color tones which provide a vibrant and crisp picture quality. The dynamic contrast ratio, or the ASUS Smart Contrast Ratio, can be manually activated in the OSD menu. However, that feature is also incorporated into the ASUS Splendid Video Intelligence Technology feature which consists of six pre-calibrated presets. These picture presets include Scenery, Theatre, Night View, Game, sRGB, and a Standard mode. Each preset features optimal settings of brightness, contrast, sharpness, and color parameters in order to provide you with the best viewing experience possible for the corresponding activity. You can quickly swap these presets by pressing the first OSD button that’s placed on the bottom bezel. Besides swapping between the pre-calibrated presets, the other OSD buttons can also be used as shortcuts for auto adjustment, quick contrast/brightness adjustment, volume, and input source selection. Once you enter the menu, you will be greeted by an user-friendly and simple-to-use OSD settings. Firstly, you will be able to adjust the mentioned Splendid picture presets. After that, you can tweak the color settings. In this section of the settings, you can adjust brightness, contrast, saturation, color temperature, and skin tone. The color temperature feature includes four different presets including Cool, Normal, Warm, and the User mode in which you can manually input the red, green, and blue color levels. The Skin Tone presets include Reddish, Yellowish, and Natural; they can be used if you prefer a glowy hue around the picture. Under the Image settings, you can adjust sharpness, aspect ratio (4:3, Full, OverScan), and analog settings for the VGA port such as the vertical and horizontal position, clock, phase, etc. In addition, you will be able to increase the response time with the TraceFree option, change input sources, and enable/disable the Eco mode which saves on power consumption by producing the image with a bit weaker gray levels but equal brightness and color saturation. The ASUS VE248Q TN display features a rather slim design at this price point which makes it appear much more expensive. The cabinet is glossy black while the screen is covered with an anti-glare protection. The stand is quite steady, however, it offers no ergonomic functionalities as only the screen of the monitor can be tilted by -5, +20 degrees. There are 100 x 100mm pattern adapter holes for the VESA mount if you wish to place the monitor on the wall or a mounting arm. As far as connectivity is concerned, the ASUS VE248Q 1080p monitor features a VGA, a DisplayPort, and an HDMI port. At the back of the monitor, there are also audio ports for the built-in speakers and for headphones. However, only HDMI and DisplayPort can output audio through the port. In the box of the monitor, you will receive a quick start guide, a three-year warranty, a power cord, an audio cable, a VGA cable, and an HDMI cable. 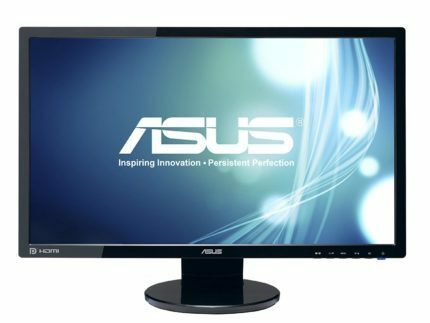 At the moment (May 2017), the ASUS VE248Q monitor is available for around $157 which is a reasonable price considering the slim design, Full HD 1080p resolution, and the unique features. 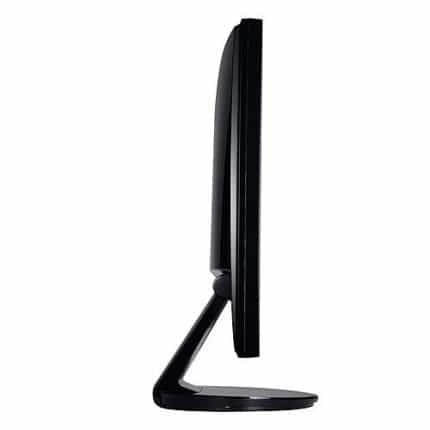 This monitor is also available as a 21.5-inch, 23.6-inch, and a 27-inch version. You can check them out at the following links. The ASUS VE228H, the ASUS VE247H, and the ASUS VE278Q. Some of them are also available with different connectivity options, for instance, two HDMI ports instead of an HDMI and a DisplayPort. The ASUS VE248Q display offers Full HD resolution for an immersive movie-watching experience and a high-quality 1080p gaming for a reasonable and affordable price. Moreover, it offers an exceptionally quick response time for zero ghosting, a beauteous, slim design, and a plenty of features including the well-optimized picture presets and the built-in speakers. Overall, the monitor delivers a remarkable performance, vibrant picture quality, and features an enticing design for a very appealing price. The ASUS VE248Q offers Full HD resolution, quick response time, and some unique features for a very appealing price. It’s an affordable monitor ideal for casual gaming, movie-watching, and everyday use. The beauteous design makes it appear much more expensive.